PT United Tractors Tbk - UT or commonly known as "United Tractors" (IDX : UNTR) is a leading public-listed heavy equipment and mining company in Indonesia. United Tractors has main business focus on three business pillars: Construction Machinery, Mining Contracting and Mining. PT United Tractors Tbk is a directly-owned subsidiary company of large and solid business conglomerates PT Astra International Tbk (Astra Group, IDX:ASII). As today, United Tractors is 59.50% owned by Astra Group and 40.50% by general public and investor. 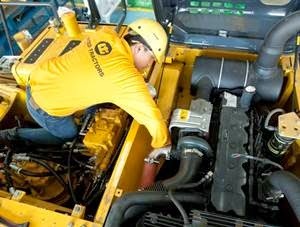 Domiciled in Jakarta, United Tractors has 19 branches 22 site support offices, 11 representative offices, 14 mine offices, 39 workshops, 8 re-manufacturing facilities, 117 warehouses spread all over Indonesia. PT United Tractors Tbk also supported by 12 subsidiary / affiliated companies (as of December 2016). According to information found in PT United Tractors Tbk Quarterly Report 9M 2018 as cited by JobsCDC.com, United Tractors managed to recorded positive financial performance in the first nine month of 2018 (ended in 30 September 2018). Referring to its report, United Tractors recorded total consolidated net revenue of Rp61.1 trillion in the first nine months of 2018. This reflected an 32% increase as compared to Rp46.3 trillion in the same period 2017. United Tractors booked total net profit of Rp9.1 trillion in the first nine months of 2018, increased by 61% as compared to Rp5.6 trillion in the same period 2017. Minimum S1 majoring in Mathematics, Statistics, and Engineering. Minimum GPA of 3.20 out of 4.00 grade scale. Minimum S1 majoring in Marketing, Design, Advertising, Communication and any related background. Technical experience to use Digital Touch Point (google analytics, social-bakers, hoot-suite, social-listening tools). Have strong communication skill (verbal and written). Strong interpersonal skill and good in working with team. JobsCDC.com now available on android device. Download now on Google Play here. Please be aware of recruitment fraud. The entire stage of this selection process is free of charge. PT United Tractors Tbk - Data Scientist, Digital Marketing Executive UT Astra Group March 2019 will never ask for fees or upfront payments for any purposes during the recruitment process such as transportation and accommodation.